Safe Teen Driving Blog - Page 52 of 67 - Safe Teen Driving Blog - Providing a solid base for teen drivers by improving behavior, attitude, skills and experience. Teaching your teen to drive is an exciting and highly anticipated rite of passage that means greater independence lies ahead. It may also be a time of mixed emotions. Many parents look forward to the day when they won’t be their teen’s main source of transportation, but they may also feel anxious about how safe their teen will be behind the wheel. A plan of action will reduce the anxiety you feel about teaching your teen to drive. There are several actions you can take before you even allow your teen behind the wheel. New drivers copy driving behaviors they have witnessed for years as passengers. Since they have probably ridden most often with parents, those behaviors are the ones they will imitate. To some parents, this is a somewhat frightening prospect. To make matters worse, teens who integrate risky driving practices into their own behavior do so without the benefit of years of experience and highly developed skills. Before you begin teaching your teen to drive, consider your own driving habits and make a commitment to correct any careless or reckless behavior and model good defensive driving practices consistently. Another important aspect of teaching new drivers is good communication. Teens tune out lectures, so parents should work on developing a conversational rapport about safe driving with their children. Try to be concise; avoid going off on tangents. Ask for your teen’s opinion on hazards in your driving environment. For example, if you see children playing near the street, ask your teen to explain the risks and how to handle them. You can fill in details garnered from your own experience after your teen has a chance to be heard. Although it’s important to talk about driving risks, avoid horror stories. Instead, look for driving-related newspaper articles or subscribe to the National Safety Commission’s Safe Driving Teen Monthly Bulletin and discuss the articles together. To help your teen understand more about the costs and responsibility of driving, review your insurance policy together, visit your insurance company’s website together, or pay a joint visit to your insurance agent’s office. Explain, or ask your agent to explain, the purpose of motor vehicle insurance. Discuss the cost of insurance and how the cost of your policy might increase or decrease. Ask your insurance agent whether a driver education course will result in a discount. Find out how much your insurance premium will increase after a single ticket or crash. For many parents, driving is such an ingrained habit that they must refresh their knowledge about fundamental driving concepts. Doing so can only help you to be a better driving instructor to your teen, which in turn will help your teen be a better, safer driver. We cannot avoid environmental conditions when we drive. Sometimes, conditions are favorable: a clear day with good visibility. Other times, challenging environmental conditions such as rain, fog and wind exist. Understanding how to properly handle these challenging conditions will make driving in them safer and less stressful. Even a day filled with sunshine can present problems when driving. Too much light can make it difficult to see ahead. Wear sunglasses or use your sun visor. Always keep the lower edge of the sun visor pushed toward the windshield. Clean the inside of your windshield and all windows at least once per week. Sunshine on a dirty windshield creates glare. Night driving requires adjustments too. The lack of light reduces detail and conceals hazards such as pedestrians, bicycles, stalled cars, and curves. It is more difficult to judge the speed and position of other vehicles. You must depend largely on your headlights, which will show only a relatively short and narrow path ahead. Headlights do not bend around corners; they will only illuminate what is directly in front of you. Highway lighting may be limited. Glare from roadway lights, business signs, and the headlights of oncoming vehicles may impair your visibility. Other conditions that can greatly affect visibility are fog, haze, smoke and mist. Be especially careful of patches of fog in valleys and low-lying areas. It is best not to drive in fog or smoke. If you must, slow down, turn on your low beam headlights, and be ready for a fast stop. Be alert for slow-moving or stopped traffic. Check your rearview mirrors frequently for vehicles that are approaching quickly from the rear. Use windshield wipers in heavy fog. If the fog or smoke becomes so thick that you cannot see well enough to keep driving, pull off the road until conditions improve. Pull over as far to the right as possible, off the main travel portion of the roadway. Leave your parking lights on and activate your hazard lights. During rainy conditions, wet roads will increase stopping distance. Roads are most slippery just after it begins to rain because the rain mixes with oil dropped from cars onto the road, creating a very slick surface. When you are driving in the rain, slow down. Driving too fast in the rain makes hydroplaning more likely. When a car hydroplanes, the tires ride on a thin film of water instead of on the road. When this happens, you can easily lose control and skid. Your vehicle can hydroplane in as little as 1/16 of an inch of water. If the tread on your tires is worn, your vehicle is more likely to hydroplane. Besides slowing down, you can also reduce your chances of hydroplaning by making sure your tires have the right air pressure and good tread. If your vehicle hydroplanes, ease your foot off the gas and allow your vehicle to slow down until your tires gain traction with the road. For 23 million students nationwide, the school day begins and ends with a trip on a school bus. The greatest risk is not riding the bus, but approaching or leaving the bus. According to the National Highway Traffic Safety Administration (NHTSA), since 1997, 152 school-age pedestrians (younger than 19) have died in school transportation-related crashes. One-half (50%) of all school-age pedestrians killed in school transportation-related crashes were between the ages of 5 and 7. More school-age pedestrians have been killed between the hours of 3 and 4 p.m. than any other time of day. The NHTSA offers school bus safety tips for both drivers and children. You can use these safety tips to raise the awareness of the potential hazards with your children, as well as become a safe driver yourself. Learn and obey the school bus laws in your state. –Yellow flashing lights indicate that the bus is preparing to stop to load or unload children. Motorists should slow down and prepare to stop their vehicles. –Red flashing lights and extended stop arms indicate that the bus has stopped, and that children are getting on or off. Motorists must stop their cars and wait until the red lights stop flashing, the extended stop sign is withdrawn, and the bus begins moving before they can start driving again. When driving in neighborhoods with school zones, watch out for young people who may be thinking about getting to school, but may not be thinking of getting there safely. Slow down. Watch for children playing and congregating near bus stops. Be alert. 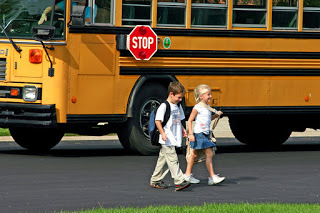 Children arriving late for the bus may dart into the street with out looking for traffic. Arrive at the bus stop at least five minutes before the bus is scheduled to arrive. Wait until the bus stops, the door opens, and the driver says that it’s okay before stepping onto the bus. Use the handrails to avoid falls. When exiting the bus, be careful that clothing with drawstrings and book bags with straps don’t get caught in the handrails or doors. Walk at least three giant steps away from the side of the bus. Many teen drivers today are turning to motorcycles, mopeds and scooters for transportation. These vehicles cost little to nothing (in the case of electric scooters) for gas, are easy to maneuver and park, and in some states, mopeds and scooters can be legally operated at a younger age than required for passenger vehicles and/or can be legally operated without a driver’s license. But the benefits of these vehicles are offset by the compromise in safety. Motorcycles, mopeds and scooters are less visible in traffic, and their riders are much more vulnerable to injury in a crash. Riders of these vehicles must take this into account. Make training a priority. Even if a license is not required, for safety’s sake, practice extensively in a variety of road and weather conditions. Learn how to minimize wobbling when accelerating and how to avoid locking the wheels when braking. Ask a seasoned rider for help. If a license is required, make sure to get one – about one-quarter of fatally injured motorcycle riders don’t have a valid license. Choose the roads you use carefully. Try not to select those with heavy, fast-moving traffic. Mopeds and scooters are not allowed on some roads. Watch for vehicles following you too closely. You have the ability of stopping much more quickly than cars. If you stop quickly in front of a vehicle that is following too closely, you could be run over. Drivers may tailgate a moped or scooter because these vehicles often travel at lower speeds than cars. Use a hand or electric signal well ahead of a stop or turn to give drivers behind you time to slow down. All of these vehicles are less stable and less visible than cars, but motorcycles combine this with high-performance capabilities. Don’t overuse the power of the motorcycle and cause a crash. Per mile traveled, the number of deaths on motorcycles is about 26 times the number in cars. Weather and road conditions present greater difficulties for you than to the driver of a passenger vehicle. A puddle may hide a hole that jolts a car; the same hidden hole can throw your vehicle out of control. 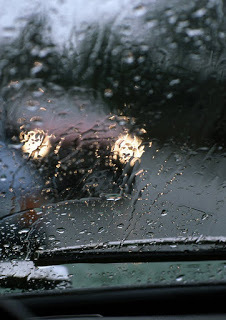 When it rains, reduced traction may make it difficult for you to see and balance and reduce your control of the vehicle. A wind gust could move your vehicle across an entire lane. Gravel roads decrease traction and may cause you to slow down or brake where a car or not. Anticipate these changes whenever possible and begin slowing down early so vehicles behind you will have time to react. Use extra care when crossing railroad tracks. The tires of your vehicle could get caught in the grooves of the crossing, causing you to lose your balance. Never carry a passenger unless it is legal and you are comfortable doing so. Passengers change the way you operate your vehicle. If you are inexperienced in transporting a passenger, you may have extra difficulties with balance and control of your vehicle. Whether it’s required by law or not, always wear a helmet. Helmets are about 37 percent effective in preventing rider deaths and about 67 percent effective in preventing brain injuries. A rider who isn’t wearing a helmet is 40 percent more likely to suffer a fatal head injury compared with a helmeted rider. Learn more about how to get your motorcycle learners permit and license today and start your adventures safely! Most parents live in dread of the day their teens get a driver’s license and get behind the wheel alone. Their concerns are well-founded, since teen drivers have the highest death rates in car crashes of any age group. Motor vehicle crashes are the number one cause of death among Americans aged 15-20. -They don’t wear safety belts. -They panic/overcorrect in emergency situations. -They drive too fast for conditions. -They ride with other teens. In this, part five of the series, we’ll discuss a frequent cause of injury and death in traffic crashes for teens – even when they aren’t driving. Riding with other teens is a high-risk activity that your teen will probably participate in even before earning a driver’s license. No matter how skilled a driver your teen is, s/he is still at risk when riding in a vehicle driven by another teen. And it’s common for teens to pack a vehicle full of friends who are unlicensed or who don’t have access to a vehicle or to save money on gas. Unfortunately, they also do this because it’s fun to listen to music, laugh and talk – huge distractions for an inexperienced driver. According to the National Highway Traffic Safety Administration, crash risk for teenage drivers increases incrementally with one, two or three or more passengers. With three or more passengers, fatal crash risk is about three times higher than when a beginner is driving alone. About two-thirds of all crash deaths of teens that involve 16-year-old drivers occur when the beginners were driving with teen passengers. Studies indicate that passenger restrictions can reduce this problem. Passenger restrictions for teen drivers already exist in many states as components of graduated licensing programs. For parents, knowing and enforcing these passenger restrictions means reducing their child’s risk of injury or death in a traffic crash. While this sounds easy enough, many parents are unfamiliar with the graduated driver licensing laws in their state. And even those who are familiar may neglect to enforce the restriction. A 2000 survey by the Insurance Institute for Highway Safety found that 84 percent of parents of young drivers favored restricting teenage passengers during the first six months of licensure. But some studies indicate that parents leave enforcement of most graduated licensing restrictions to law enforcement – a mistake, since law enforcement does not have the ability to monitor the behavior of an individual teen the way parents do. To help ensure the safety of your teen, learn the graduated driver’s licensing laws in your state, and make enforcement of them part of your house rules. Monitor your teen’s driving behavior, and review the restrictions often. Although parents often want their teens to get driver’s licenses so they can transport themselves to school, work and social activities, parents also worry about the risks. Make sure your home driver education program is complete by using a log to keep track of your teen’s progress.